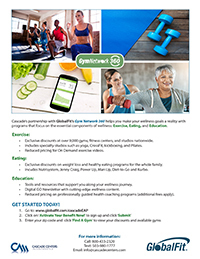 Cascade's partnership with GlobalFit's Gym Network 360 helps you make your wellness goals a reality with programs that focus on the essential components of wellness: Exercise, Eating, and Education. 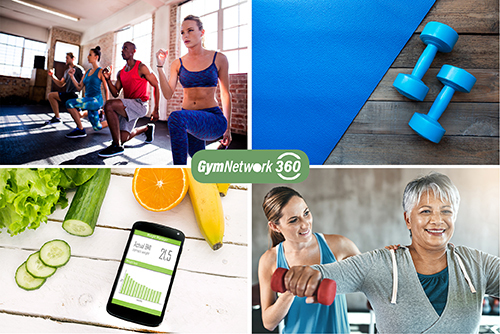 • Exclusive discounts at over 9,000 gyms, fitness centers, and studios nationwide. • Includes specialty studios such as yoga, CrossFit, kickboxing, and Pilates. • Reduced pricing for On Demand exercise videos. • Exclusive discounts on weight loss and healthy eating programs for the whole family. • Includes Nutrisystem, Jenny Craig, Power Up, Man Up, Diet–to–Go and Kurbo. • Tools and resources that support you along your wellness journey. • Digital GO Newsletter with cutting–edge wellness content. • Reduced pricing on professionally guided health coaching programs (additional fees apply).